Delicate raw finger taps on an acoustic guitar on The Wolves (Act I and II) send shivers down my spine. When someone creates a piece of art that can move you to goosebumps, furthermore to tears, it makes them unforgettable. The spider-webbing found most famously in Elliot Smith’s catalog finds it’s way to Bon Iver’s debut record For Emma, Forever Ago. There are also sounds of trains crossing the tracks and the white noise of winter woods. There are rare moments when a sophomore album has such high expectations. When it seems almost impossible that it can surpass the debut. Few performers and writers can really satisfy themselves while giving the people what they want. With the release of the self-titled Bon Iver, Justin Vernon spreads his wings yet again, without leaving his home base too far behind. This new record is full of beauty, just like the last. Poetry flows, we learn how to love through sound (again), and the train reappears only to fool you in the five seconds of album-opener-silence. Bon Iver demands your attention immediately with Perth. Horns, drum line snares, there are strings and electricity is everywhere. Epic and ever present (perhaps learned from last year’s collaboration, work with Kanye West) songs rise and fall into each other forming a completely compelling unique concept record of places to be found in its sonic visuals and lyricism. The euphoric dreams found on this record have soundtracks of their own. Lying in bed on a rainy day, driving in the country during summertime or doing what we all do – imagining life’s soundtrack in those most perfect moments. Justin Vernon creates an atmosphere unlike any other singer and songwriter. It is what he’s known for. His production is tight and clean after the past’s remote recording. Waiting three years between records not only tested our patience but let him take his time on a form of music that needs it most. Certainly following his habits, these sounds are anything but recycled. If they sounded all the same, you wouldn’t find that new moment in every track. (Perhaps tested on 2009’s Blood Bank EP.) 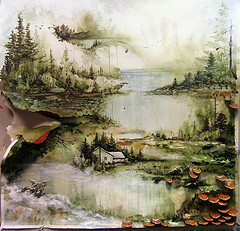 Bon Iver is peaceful music that helps you find peace in your headphones and perhaps within yourself. Echoes found in Minnesota, WI and Michicant, while produced, are romantic and let your eyelids flutter with relaxation. The pianos trickling in Wash. follow your heartbeat. And then he grasps us with his groans on Hinnom, TX. While For Emma, Forever Ago is intimate in more ways than many and can make you feel alone, Bon Iver is well versed in progressions and choruses and still remains private. Chiming guitars on Holocene bounce inside your head and the claps pulse along with you. Musicians and creators included on this record gained his trust and certainly gained ours with the comfort they provide. It is on the standout closing track, Beth/Rest – including it’s transition Lisbon, OH – where Vernon may receive some guff. But it is here where he finds a new path. Vernon closes this record with unfamiliar and almost unwanted sounds. Those pieces have been described to me as elevator music or the height of cheese in ’80s flicks as the guitar and sax come in. But this listener finds comfort in his change. I hear him do well with it. As writing goes, Bon Iver – whether you want to participate or not – creates a space you cannot escape. While the lyrics are beautiful and almost hummed to us, it is simply the sounds that get us lost in Vernon’s woods. It’s the sort of record you need to physically remove yourself from. Without music and art like this there would be nothing to live up to. Bon Iver leaves us with synthetic ringing into the future. Hopefully we don’t have to wait too long to see what’s next. But as it goes, usually that works out best. Out on Jagjaguwar June 21st, Bon Iver leads you to discovery. Whatever it is, you’ll find out for yourself.